As a veteran of the vietnam war, somebody, actually a lot of somebodies, convinced me I could make some decent money by applying for a PTSD disability. So I got to thinking about what I would have to say to a shrink about my combat experiences that had led to this Post Traumatic Stress Disorder. When I got out of the army had you suggested that I had a psychological disorder a result of … all that, I would have hurt you. But, later it occurred to me that I had led a disordered life after a period of traumatic stress, and that sounded like Post Traumatic Stress Disorder to me, so I decided to apply for the disability. Going over what I’d have to say to the shrink I went from being a pretty happy guy to near suicidal in about twenty minutes. So, I cranked up all my Toltec techniques for getting into a better frame of mind and got out of despair. 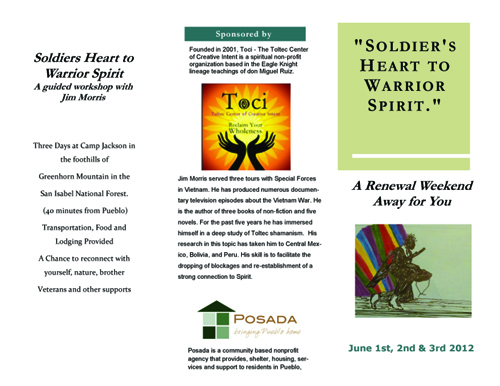 Realizing it was the same funk I had been sunk in for years, and that there was a specific program for getting out of it, the Toltec work I had spent so much time and travel on, I resolved to teach it to my fellow veterans. The Toltec work is a warrior discipline and I’m convinced it grew out of the old Toltecs putting their fighters back together after their frequent wars. Most of the people who study that work today are veterans of other traumas, of which there is no shortage in our society. But it came from vets and I’d like to take it back to them. So, here it comes, another great ride. 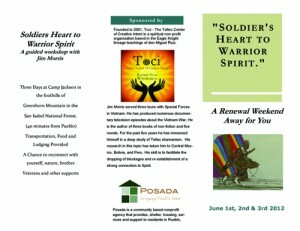 Here is a brochure from last years veteran’s workshop with Posada in Pueblo, CO.